Contrary to popular belief, water damage is not only caused by severe weather conditions and flooding, but can also be caused by faulty appliances, overflowing toilets, extreme humidity, or damaged plumbing. And it is important that, should your home incur water damage, you follow the necessary steps to accurately assess, and then begin the Water Damage Restoration Process. Otherwise, in addition to the water damage itself, you will find yourself facing other, very serious health issues that will dig even deeper into your wallet. Most times, extreme cases of water damage, if not caused by flooding, are caused by appliances that are left on or that malfunction while the homeowner is away for an extended period of time because the more time that passes, the more water damage that is done. When any type of water damage occurs in the home, it is important to first accurately appraise the damage that has been done, then call a Gainesville flood damage company. If for any reason you fail to identify a part of the property that has been damaged in an event and do not rectify the issue, leaving the water to sit and rot the infrastructure, you will also most likely need to deal with mold, infestation, and property repair. In order to prevent future inconveniences, you always want to check your home thoroughly to ensure that all the flood damage that has been done to your home is addressed quickly and properly. Once you have assessed all the water and flood damage that has been done to your property, the next step in the process is actually removing the water from the home and thoroughly drying the carpet, walls, etc., that were affected by the event. Furthermore, it is important to ventilate the home during and after the drying process to make sure that no humidity is trapped in the house. Again, both of these steps are crucial in preventing further damage, such as mold propagation. 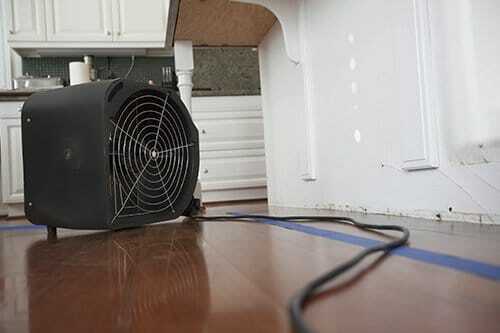 Call the Best Restoration for water damage restoration services. Flooding from the outside world, from home appliances (such as a dishwasher), or from a toilet or bathtub can result in certain debris – from fungus to food particles or feces – being carried throughout the home. This can obviously elicit various health concerns and so the processes of clearing the debris and of decontaminating the affected areas are crucial. The final step in the process is making sure that no significant structural damage has occurred to the property. If there is structural damage, then you will need to repair the damage before a weakened beam turns into a structural deficit in the flooring such as a hole in the floor or a broken step on a flight of stairs. This is another component of the process that is time sensitive: the longer you wait to have these repairs completed, the more damage that will be done and the more money you will likely have to pay later. When seeking out Gainesville water damage restoration services, you want to make sure that the technicians you hire will remain on-site throughout the process to ensure that your home is being dried evenly and that no part of the house is missed. The two key elements to this process are the speed and thoroughness of the Water Damage Restoration process: neither can be compromised for the sake of the other.